“It makes me feel good that young people are taking over protecting our country. Us old guys can’t do it anymore,” said… Dusty Ward (89), a resident of Waterford Terrace, La Mesa, and a veteran himself. 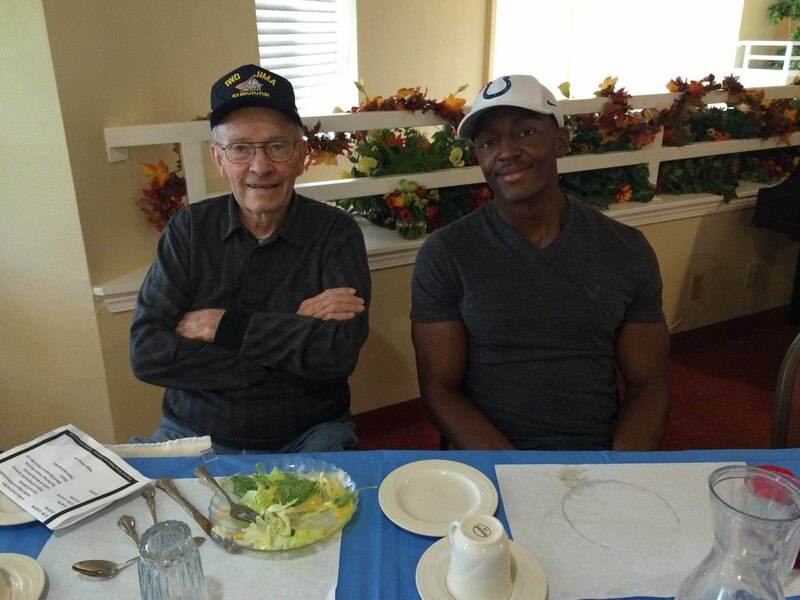 On November 10, to celebrate and honor Veteran’s Day, a group of young Marines from the Wounded Warrior Battalion West, Balboa Naval Hospital, visited the residents of Waterford Terrace and swapped stories about life, war and the challenges of re-entering civilian life. Casually sitting around the tables scattered outside of the dining room, the residents and Marines had a chance to share photos and swap tales of their experience in the service. Many branches of the armed forces were accounted for with the Marines, Army, Air Force and Navy represented. One of the high points of the day was when the two young women Marines had a chance to chat with some of the women at Waterford who had served in the armed forces. As they were thanked for their service, the women from the Wounded Warrior Battalion were able to thank the women who served before them and to find out what it was like to be a woman Marine or WAC, before it was commonplace for women to enlist. 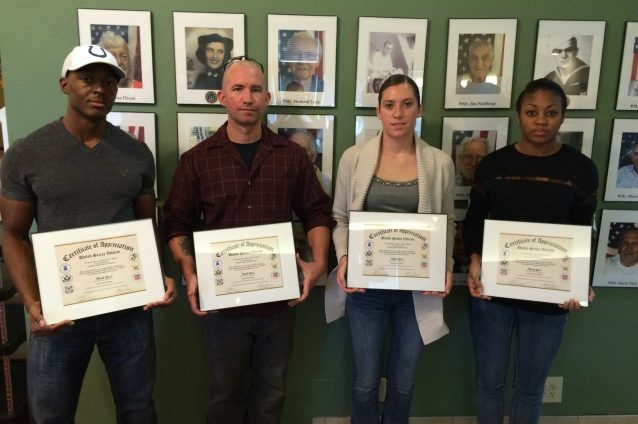 When asked about their injuries, the marines were able to explain to those who asked that “their injuries were internal” and did not always show on the outside. Many of the Marines have Post Traumatic Stress Disorder (PTSD) or Traumatic Brain Injuries (TBI), which are difficult to diagnose and treat. The Marines in the Wounded Warrior Battalion are still on active duty and their “job” is to work at recovery 24/7 by going to doctor’s appointments, working with their physical therapists, attending classes and doing everything in their power to either return to their units or reintegrate in society with the ability to use the skills they have learned in the Marines to start a civilian life. After Ken Rorabaugh, General Manager, officially welcomed the guests to lunch and presented each Marine with a certificate of appreciation, one of the Marines stood up to address the full lunch crowd. As he looked out across the faces of those who had served before him, and the women who served or kept the home-fires burning bright, he said, “Many of us signed up because we were escaping, but you signed up for the real reasons. 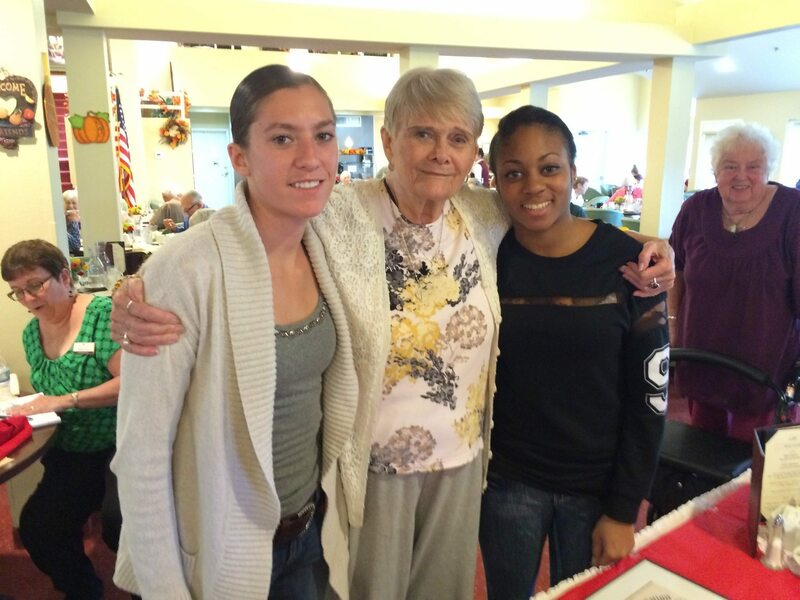 You are the true patriots.” There was a moment of silence, a few tears, and a round of applause to remember the veterans and thank the Wounded Warriors who shared this memorable meeting with the residents of Waterford Terrace. About the Wounded Warriors: The Wounded Warriors Project is a nonprofit organization that aims to provide and facilitate assistance to wounded, ill and injured Marines, sailors and their family members throughout their phases of their recovery in order to successfully return them to full duty or transition to civilian life.